Microscopic investigations of water samples from the half-barrel pond in Christchurch House courtyard have revealed a menagerie of single-celled life. 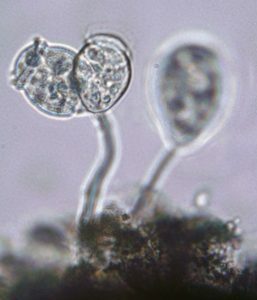 These tiny organisms (smaller than one tenth of a millimetre) are incredibly important as they form the basis of food webs. 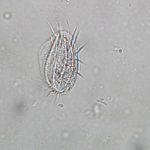 They also play a major role in maintaining water quality as they feed on bacteria, and stalked species such as Vorticella (image) are responsible for their removal in waste-water treatment plants. The half-barrel “pond” may be almost as small as its inhabitants but it promises to become a treasure of local ‘hidden’ biodiversity!